Your book is finished and final edits complete. 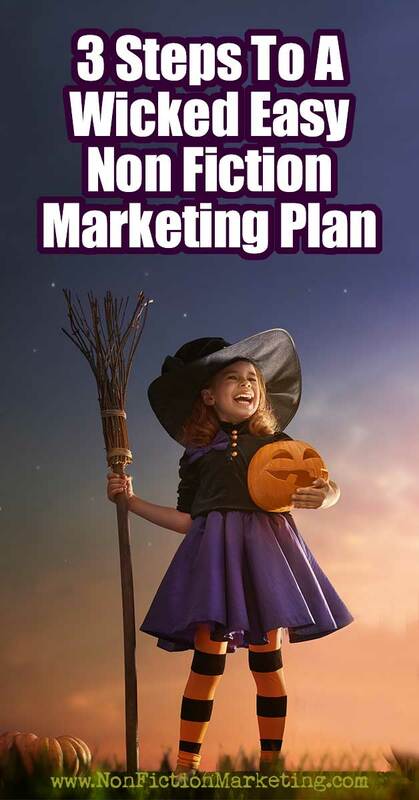 While you are waiting for the final copy it would be a good time to get your marketing plan in place. Don’t worry, it doesn’t have to be difficult. In fact, you can make it wicked easy and successful! So first things first…who is your audience? You need to know who you are marketing to, meaning: define your audience. What is your niche? You can figure it out by starting with what you wrote about. That will tell you what the audience will be. Your book is about corporate leadership. That will give you a very wide audience and that will make marketing it difficult. Narrowing the focus of your audience to something like women in corporate leadership or leadership in the training industry you will have an easier time finding and connecting with your audience. The great thing is that there is no limit to the number of these “niche audiences” that you can target in your marketing! 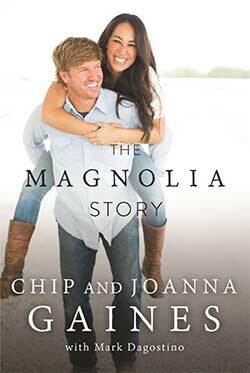 If you have not heard about them then you might not know that they have a hit HGTV design show and live in Waco TX. But their potential audience for marketing extends way beyond that little slice of the United States. They are a Christian family who doesn’t mind talking about their faith so they could target that in their marketing. They are a funny couple with 4 cute kids so they could target the Mommy groups and sites. They do home design so all the decorating gals would be a great audience. They love Baylor football so could hit some sports analogies easily. She loves antiques and retro which is a huge audience in itself. That is just the tip of the iceberg for audiences that this couple could start interacting and posting for! There are a lot of reasons to do this. One, you can use some of their marketing ideas. Another is that looking at and reading four or five of your competitors books and marketing will be a huge help in figuring out how your book is different from the rest. That will give you a marketing edge over them. If you want to get your book noticed setting it apart from the rest is really important. That said, their groups and followers could be a “ready made” target to start shooting for! For example, say you have written a railroad history book. The first thing I would do is a quick search on Amazon for “railroads” and then sort by publication date. 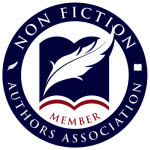 You want to find current authors and see what kinds of marketing they are doing! 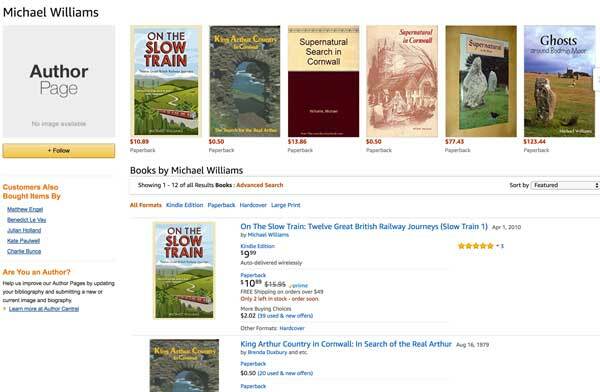 So I found Michael Williams who is a writer of train stories on Amazon. 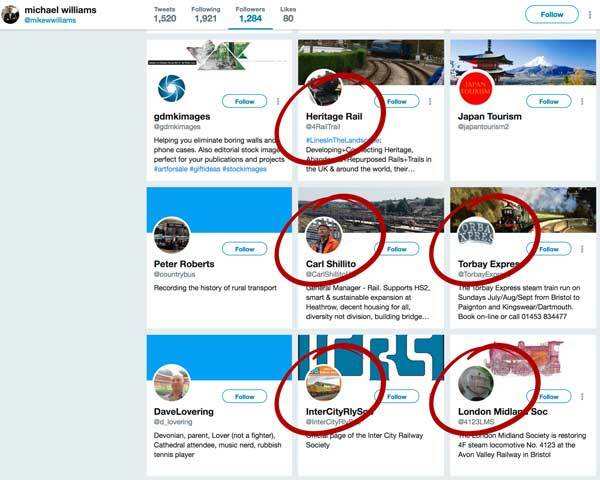 He did not have an author page so I went to google and typed in “michael williams railroad” and found that he had a Twitter account. 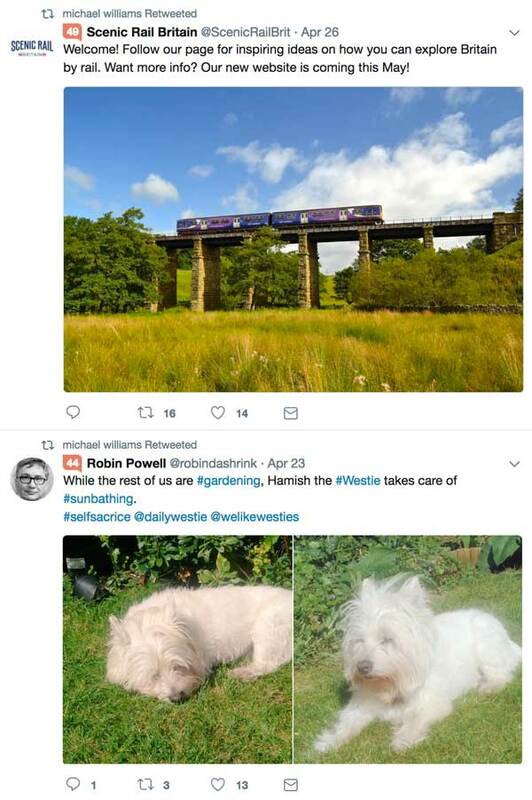 He shares other railroad tweets and pictures of his family life. So now how do find people who might want to read your book? Check the followers of other authors like Michael on Twitter! Just a quick peek showed that 5 of 9 people have some relation to railroads and would be good people to connect with! You can do this same thing for Pinterest followers, Instagram and Facebook business page followers. Please note! Making connections doesn’t mean making sales! You need to follow people, share things they will like, give them info about your topic, and generally make a connection and a relationship with them BEFORE they will buy your book! 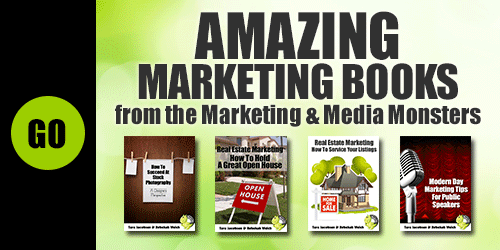 Last but not least, make sure to have great sales copy ready for all of the places where you market your book. Having it ready to go will save you time and also save you from looking like you are disorganized. Your copy should describe the book and how it will benefit your reader. What this means is how will that book help them solve problems in their lives, how will it make their lives improve? In other words, how will your book help them? A great way to figure this out is to add “so that” to the end of your chapter titles. Each of these touch on a “why” of buying the book. Triggering fear or happiness, confusion or doubt will all help your potential reader pick your book out of all the other ones out there! Edit your words into a short blurb, a medium blurb and a longer one. That gives you a version for every need you’ll have. Use the brainstorming words as posts for social media and other times you need quick comments! 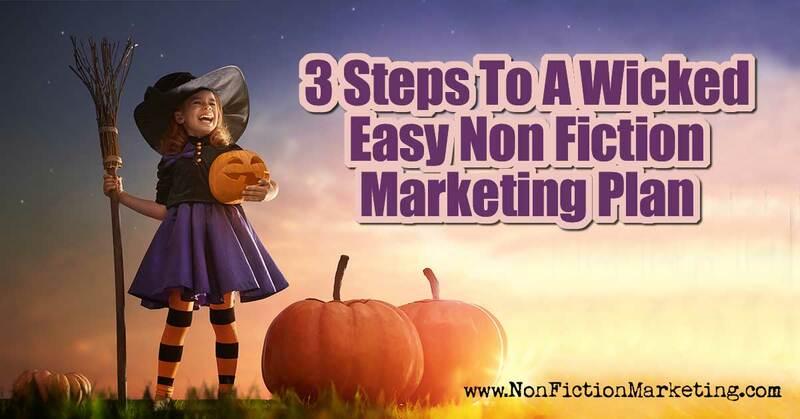 Marketing your non fiction book doesn’t have to be horrible chore. You love your topic and finding people to buy your book should not be as hard as you might think! 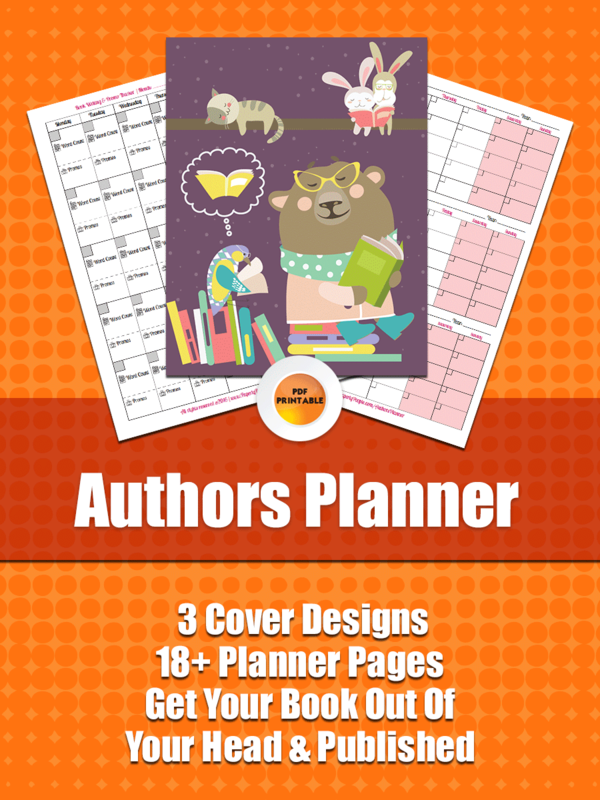 Take a little time, put a little thought into how you will be positioning your book and the whole thing can feel a lot more like fun and a lot less like work!